Those were the comments of British and Irish Lions coach Ian McGeechan, looking back on the tour win in South Africa in 1997. Martin Johnson was just the man to stand up to Mark Andrews and Kobus Wiese and set his stamp on the series. Historically, you did not beat South Africa until you could beat – and on occasion beat up – their big men. That is the reason it took the Lions until 1974 to win a series in the Republic. They could never match their big men until Willie-John Bride and Gordon Brown came together in the second row. South Africa went through three different combinations in four Tests in an effort to find an answer to those two, but they never managed it. 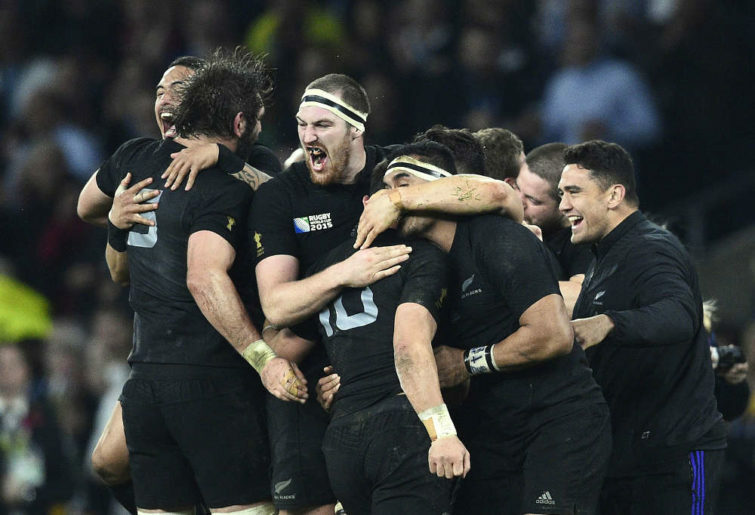 Even the All Blacks historically struggled to win a series in South Africa. In the amateur era, they had one of their best chances to win one in 1970, with the remnants of Fred Allen’s stratospherically ambitious and successful side of the late sixties. Curiously, the great Colin Meads had his arm broken in the early stages of a tour in which New Zealand were rampaging through the provinces, and Springboks coach Johan Claassen (another in the great South African second-row lineage) brought back ‘Lofty’ Nel for the decisive Tests at the age of 35. The Boks won the battle of the big men and brought home the series against the odds. Before Nel, it was Frik du Preez and ‘Tiny’ Naude. Naude had famously kicked a goal out of the clinging Christchurch mud to beat New Zealand in the third Test of the 1965 tour, with Meads giving him the evil eye from a few yards away. When Naude was stricken by Alzheimer’s disease late in life, he could still remember the events of that afternoon as clear as daylight. He still could remember Meads and du Preez, that sodden ball wrapped in the weight of history – although even his own wife and children had continually to remind him who they were in everyday life. Frik and another great Springbok giant, Schalk Burger Senior, had come to visit Naude at his West Somerset home. It was a bleary afternoon, but all of a sudden, the rain and the fog cleared. It is no accident that the All Blacks’ dominance of the global game has coincided with the rise to prominence of their own big men, the second-row partnership of Brodie Retallick and Sam Whitelock. They took over the mantle of ‘best in the world’ from Bokke pairing Victor Matfield and Bakkies Botha. New Zealand coach Steve Hansen thinks it is the best combination he has seen. Pitched against the backdrop of Meads and Sam Strahan, Andy Haden and Gary Whetton, and Robin Brooke and Ian Jones, that is high praise indeed. A couple of weekends ago in Dublin, Ireland matched and surpassed that pair, at least for 80 minutes, and that effort had a big hand in winning them the game. At the heart of their success was a young Dubliner from Blackrock, 22-year-old James Ryan. Ryan was the captain of the Ireland under 20s when they beat New Zealand for the first time in their history at the 2016 World Championships. One short year later, he found himself chosen for the senior team by coach Joe Schmidt. One year after that, he is part of the first Irish side ever to beat the All Blacks in Dublin. Like Naude, Ryan appears to be one of those big men associated with some important moments in rugby history. Perhaps it is something in the stars. 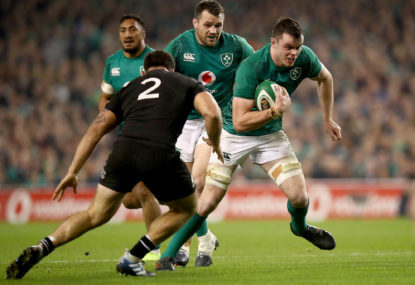 Matches in which Brodie Retallick gets outworked by his opposite number can usually be counted on the fingers of, well, one finger, but the game in Dublin was an exception to this ironclad rule. Ryan carried on 17 occasions to Retallick’s nine, and completed 20 tackles to Retallick’s 14. 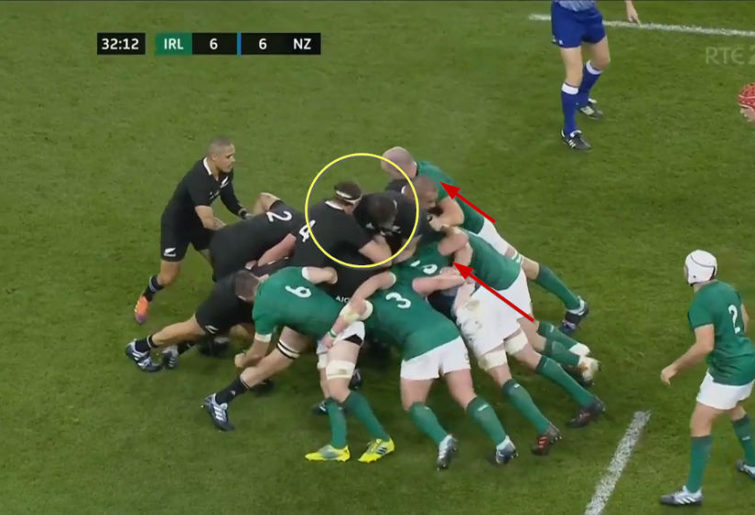 The tip-on pass from Tadhg Furlong to Ryan catches the All Blacks first receiver defence out of position, and Ryan is able to break the tackle of Karl Tuiniku’afe to make extra metres after first contact, leaving Retallick an onlooker at the ruck. One of Brodie Retallick’s unique points of difference has always been his other-worldly ability to deliver accurate passes and decisions out of the forward pod beyond the number 10. This was Toner and Ryan, driving up hard to close the space in midfield and create a turnover. At this New Zealand maul, the main two power blocks (Retallick and Whitelock) are up in the air, while Ryan is in a good horizontal driving position opposite them, with Toner containing any movement around the openside corner. It was a moment symbolic of the events in Dublin as a whole. Rugby supporters across the world remember the battles of the big men, the battles of the titans. Near the end of his life, Tiny Naude remembered them too – the battles with Colin Meads, the comradeship of Frik du Preez. The sight of his great friend du Preez helped make life clear and worthwhile once more, at least for a few moments. South Africa’s periods of rugby success, in the amateur and professional eras alike, have always been built around the stature and prowess of their big men. That has been their foundation. Only when players came along who could match or surpass them did the Bokke falter. Ever since the break-up of the Botha-Matfield partnership, it has been a story of New Zealand dominance based on the platform of second rows Brodie Retallick and Sam Whitelock – perhaps the finest combination in even New Zealand’s illustrious history; maybe the best ever. 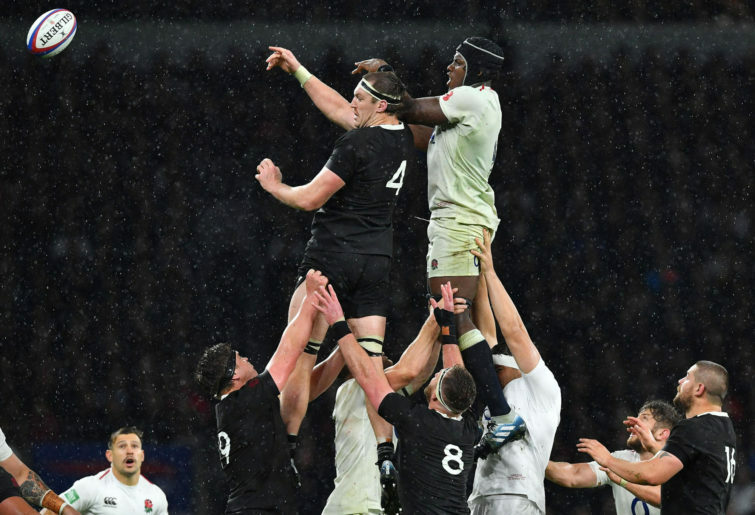 The last two rounds of the end-of-year tour have shown that the true challenge to Sir Brodie Retallick, the champion of the global second-row order, may in future come from Ireland rather than England, from James Ryan rather than Maro Itoje. Whatever the claims of England coach Eddie Jones, Itoje is not there yet. It promises to be a joust for the ages between those three at the World Cup, while Eben Etzebeth and Alun-Wyn Jones will want to have a real say in matters too. The preliminaries will kick off with the opening match of the 2019 Six Nations in Dublin, when England travel to meet Ireland, and Ryan opposes Itoje. It promises to be a battle well worth the remembering, even if neither (unlike Tiny Naude) will be called upon to kick a goal out of a mud-heap!